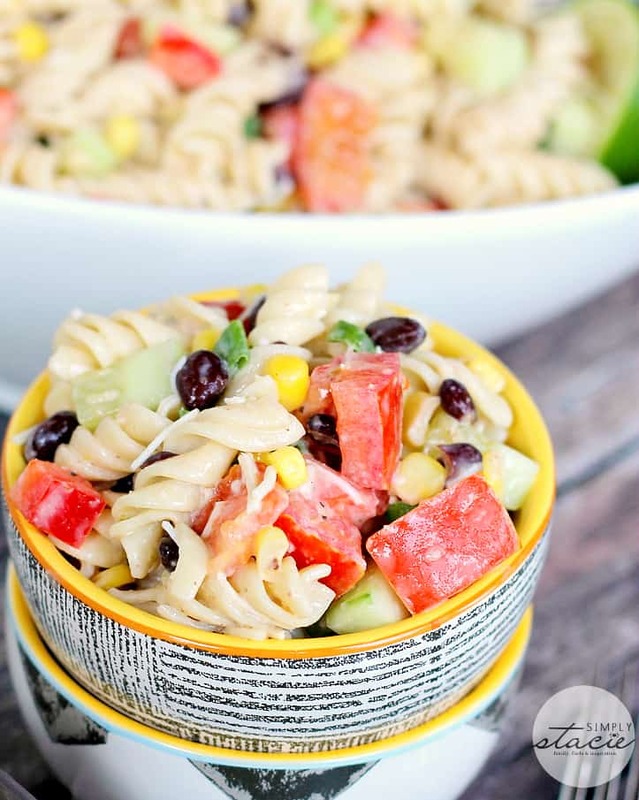 Do you like pasta salad with a creamy dressing or an oil & vinegar based dressing? I like BOTH because I’m crazy of all kinds of pasta salad. 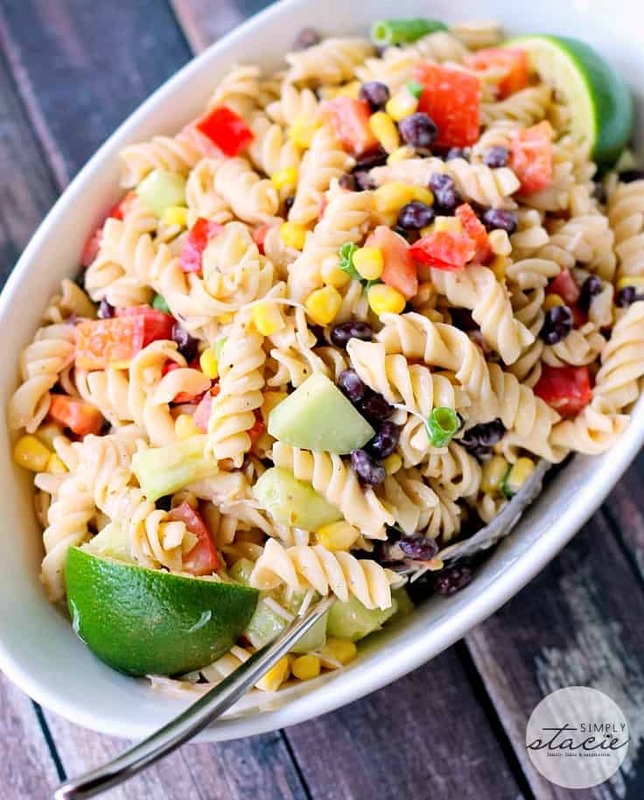 I’ve shared enough pasta salad recipes already and have a Pinterest board dedicated to this fabulous summer side dish. 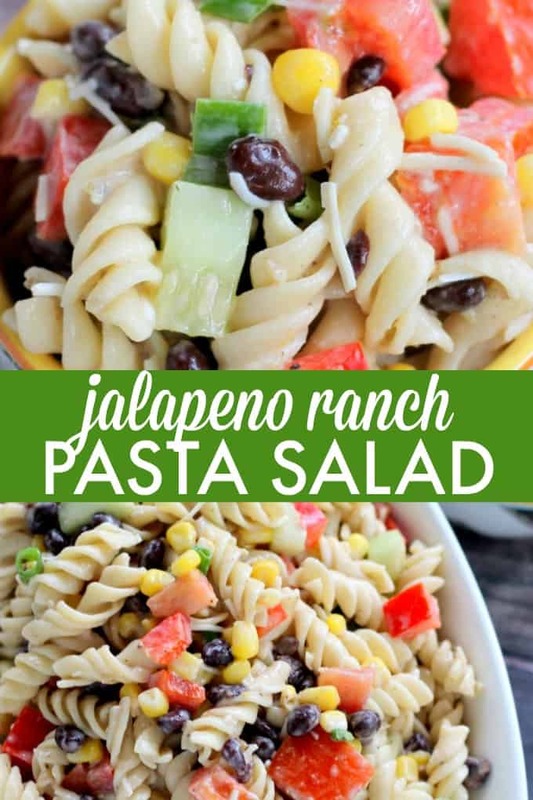 This Jalapeno Ranch Pasta Salad has a creamy, homemade ranch dressing with a kick of flavour. It’s loaded with veggies and black beans to give it a southwest edge. Use whatever kind of noodles you have on hand. Fusilli, rotini or even bowtie pasta is nice for presentation purposes. Plus with this recipe, you’ll even have some leftover Jalapeno Ranch Dressing you can save for another salad or dipping sauce. Make it the night before your event and store it in the fridge. It tastes even better after the flavours have a chance to mingle together. 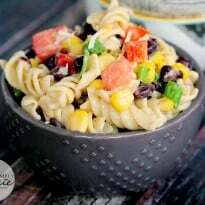 Check out my other pasta salad recipes – Roasted Pepper Pasta Salad, Greek Pasta Salad, Chili Pasta Salad, Chicken Fajita Pasta Salad, Easy Bacon Pea Pasta Salad and Bruschetta Pasta Salad. Also, check out my Pasta Salad board on Pinterest. Do you like your pasta salad creamy or oil & vinegar based? Smothered in a creamy, homemade ranch dressing with a kick of flavour. It’s loaded with veggies and black beans to give it a southwest edge. In a food processor, add milk, mayonnaise, ranch seasoning, and jalapenos; process for 30 seconds, scrape down sides, and process for a few more second. Place bowl into fridge while you continue making the salad (this needs to set at least 20 minutes in the fridge – can easily be made ahead of time and stored in fridge). Cook pasta according to package directions, making sure not to overcook. Add black beans last minute of cooking. Drain, rinse with cold water, set aside. In a large bowl, add cucumbers, red pepper, tomatoes, and corn; stir gently to combine. Add pasta and black beans, fold to combine. Add cheese, green onions, salt and pepper; folding again to combine. Pour 1 cup* of the jalapeno ranch dressing into the salad, fold carefully to evenly coat salad ingredients. Taste and add additional salt and pepper, if desired. Refrigerate for at least 1 hour** before serving. Squeeze lime juice over the top before serving. **This salad is much better if left at least half a day or overnight. The flavours meld together and it becomes even more delicious. If you feel it’s saucy enough after sitting overnight in the fridge, add a little more ranch. [br][br]*The recipe above will yield about 2 cups of jalapeno ranch- this should be stored covered tightly in the fridge, and should last for about 3 weeks. It’s delicious on pretty much anything! 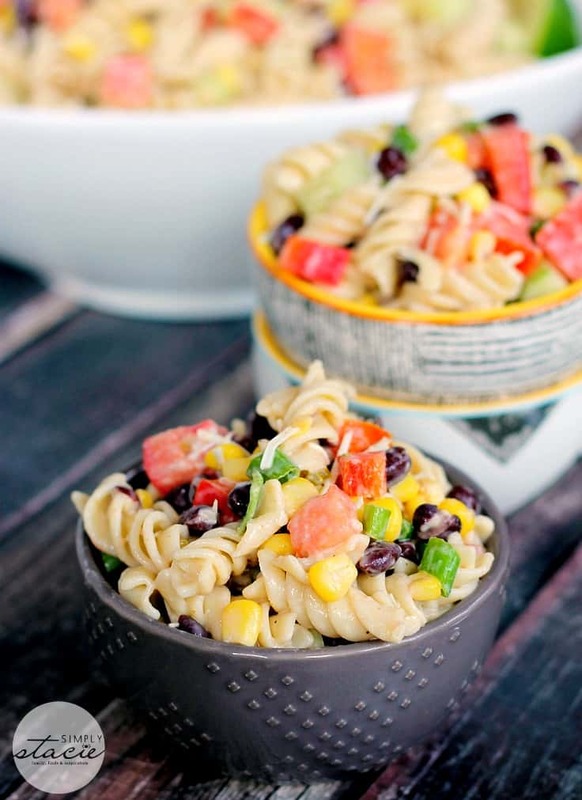 Sounds like a nice pasta salad to make for us this summer. I like the fact that the jalapeno’s are blended in with the milk, mayo and other ingredients for the dressing. I’m not a big fan of jalapeno’s so I would maybe cut or adjust the amount to add. Will be interesting to see how this will taste and go down with my husband. Excited to try. This would be perfect to add to a bbq dinner! Love all the flavor! This looks so good I had to pin it so we can make it soon the family will just love it. I always love your recipes! Nice for the 4th of July celebration too. Okay – yum! pinned and will make ASAP. This looks so good that I wish I could eat spicy food, use to love it! 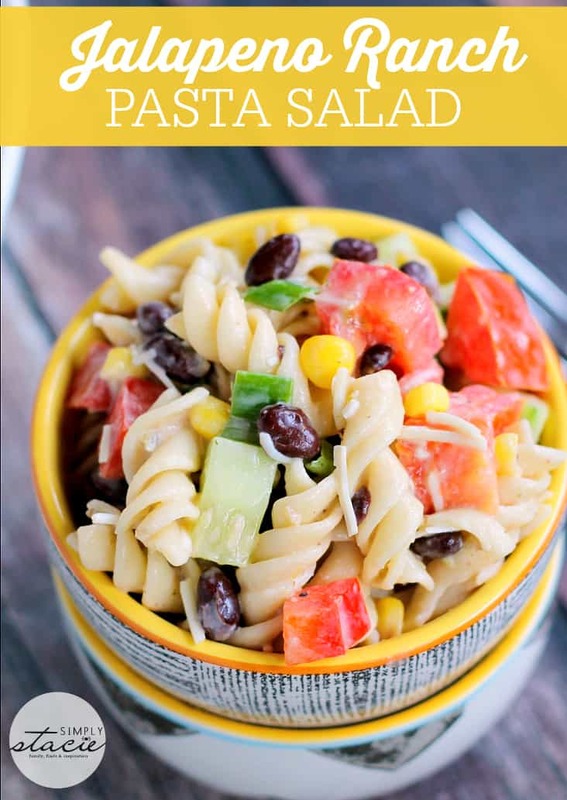 Pasta Salad is a perfect summer meal; with the heat and wanting to spend so much time outdoors, its awesome. I am always looking for new and unique recipes. I’m not a huge fan of spicy, but my husband would LOVE this. Perfect for Summer! Love a good pasta salad. Oh yummy, yummy, yummy, yummy!! That looks so good!! I make some buffalo spiced nuts which would add a little crunch to this!! I am so making this!! 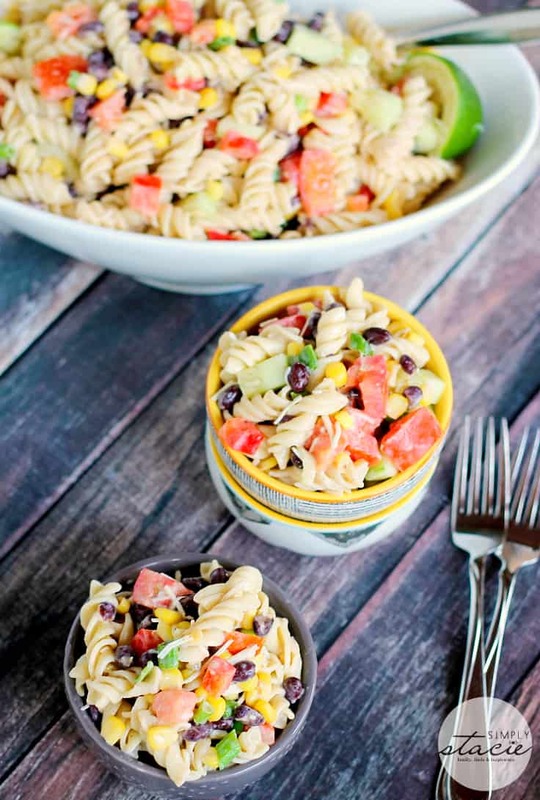 Your photography skills are wonderful because I am definitely craving this pasta salad! This looks very good, except mine can not be spicy, but looks like a great summer meal! This salad looks so amazingly delicious, pinning it! I prefer my pasta salad with a vinegar based. I will eat either tho & enjoy both! We will just love this spicy salad, yum! I really appreciate you sharing this awesome recipe with Full Plate Thursday. Hope you are having a good week and come back to see us real soon! Thanks for linking up with Happiness is Homemade #79! I’ll be pinning this also! I love pasta salads. Especially during the summer months. I especially love this recipe because of the jalapenos for a kick and the black beans for protein. This recipe would also be great on a hot summer day when I don’t feel like turning on the oven and cooking, to just add another meat protein…like a shredded rotisserie chicken! Thank you for sharing! This looks amazing! I’m trying this recipe out for sure. Thanks for sharing! This jalapeno ranch pasta would be a great addition to my cookouts with the family. This salad looks so amazing and colorful.i love that it’s spiced up with jalepenos.I will be trying this one because I live on salads in the summer. Maybe I missed it, does the lime juice go on last and get stirred in? I am serving this for a party tomorrow, can’t wait! Yes, just squeeze over the top before serving! WOW, this pasta salad sounds really yummy, I’m looking forward to trying it, thanks!